In spite of a weather forecast that anticipates an inch of slush for the 20th-annual Women’s Art Festival, I’m happily preparing to see you tomorrow at the Midtown YWCA in south Minneapolis. Once again, I’ve learned a lot from printing plants and teaching nature printing, and I’m beginning to add lettering to the nature prints. Surely I’ll learn plenty of things the hard way and be able to report my discoveries to you! 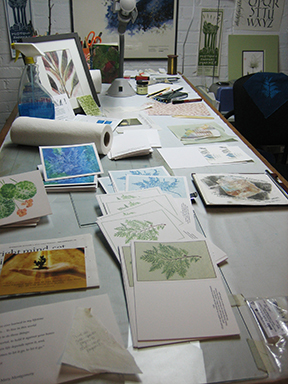 As I print, produce, and package the nature-print note cards, I look forward to being among the 125 women artists. The spirit of the event is so upbeat, and food and music add to the festivities. Invite a friend and plan to stop by. Printing materials have been cleared away to make way for folding and packaging note cards.